Bhel Recruitment . Bharat Heavy Electricals Limited (BHEL), Ramachandrapuram, Hyderabad released employment news and invited online applications through careers.bhel.in.As per the notification BHEL – Hyderabad is going recruit 800 Artisan Posts in Heavy Power Equipment Plant located in Ramachandrapuram, HYD. The last date to apply online for these posts is 5th October, 2016/2017-2016. Qualifications: National Trade Certificate or National Apprenticeship Certificate in the respective trade. 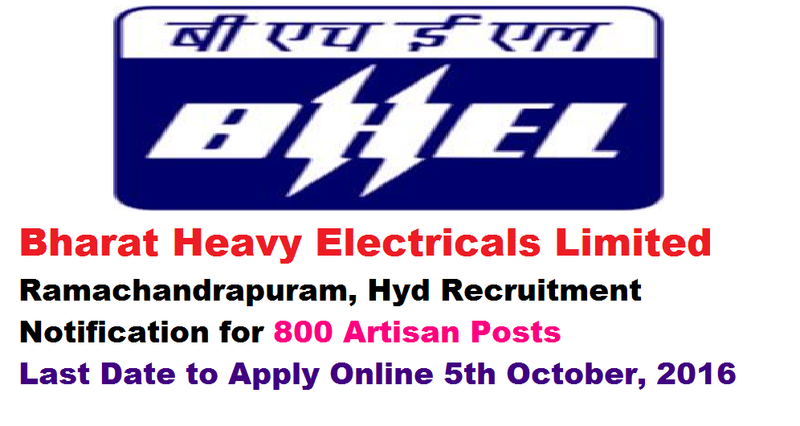 Candidates eligible and desirous can apply online by visiting www.bhelhyderabad.com or careers.bhel.in on or before 5th October, 2016/2017-2016. Upon online application the system generated acknowledgement slip along with required copies of documents to “The Post Bag No.9, Mukhya Dak Ghar, BHEL RC Puram HE, Hyderabad-502032” so as to reach on or before 12th October, 2016/2017-2016.